Back in April, I wrote about Georges Polti’s wonderfully inspiring “The 36 Dramatic Situations”, a writers tool offering 36 types of plots for a story, or in the case of our hobby, adventures. From the moment I read it, I thought “how cool would it be if somebody adapted all these to an RPG?”. I even thought of creating a series on my blog doing just that. Well, I’m glad I didn’t. It turns out that the guys behind the Gnome Stew blog were already on the case, and believe me when I tell you that their efforts are way better than anything I would have, or could have, provided in this blog! 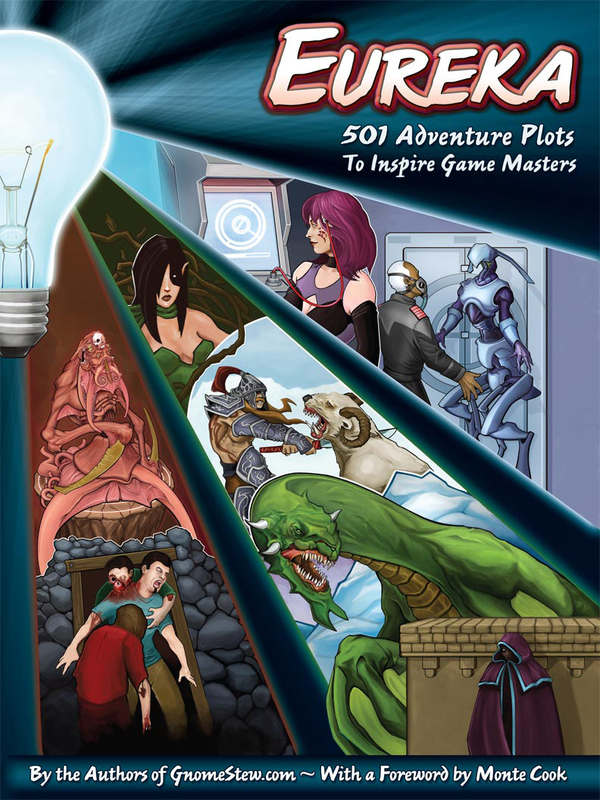 “Eureka: 501 Adventure Plots to Inspire Game Masters” is a book of pure plot hooks, using all 36 dramatic situations, and applying it to three different gaming genres: Fantasy, Sci-Fi, and Horror. This book is a treasure trove for the DM like me, who sometimes has to find inspiration in order to create stories. Remeber, there’s no shame in stealing when you are a DM, and a book like this has plenty for you to take and use. With nine authors contributing, you’ll find that the plots all have distinct styles and voices, and all are useful and easily reskinnable to your game. I can’t really tell you much more than what I’ve written. I am a huge fan of Polti’s book, and this project is a realization of something I wish I could have done for the hobby. Now that someone has done the hard work for me, I can just lean back in a comfy chair and enjoy it for a few days, because at over 300 pages, you won’t read this in one sitting. until after the preorder period. the PDF is included with the print edition at no charge. Enjoy it as much as I am! This looks amazing! I think I’ll have to get a copy! We were hard at work on Eureka one day when one of the gnomes (Phil I think) sent an e-mail round with a link to your Polti article, so we all went and gave it a read. It just goes to prove that great minds think alike! Yeah, it’s a great book, not an easy read, but a good inspiring read for authors (and game designers alike). Congratulations on the book, again, it is pretty fantastic. Thanks for writing this post, Newbie DM! There’s definitely something magnetic about Polti’s incredibly ballsy idea, even close to a hundred years later — it’s always made my brain perk up and take notice. There’s plenty of room for other products based on his work, too. For example: We largely ignored the plot elements he calls out for each situation, preferring to play loose in the interest of creating better adventures — but that’s just one POV. Using those elements would make for a very different kind of plot book.